SurfQuest is bringing more and more people with Intellectual and Development Disabilities together with a growing cadre of active volunteers to introduce the fun and comradery of surfing. There is true joy in seeing the men, women and children cheering, smiling and hurrying back for more, wave after wave. SurfQuest is a free monthly beach-day for anyone with a disability. All ages and disabilities are welcome. And together, SurfQuest is Ohana. 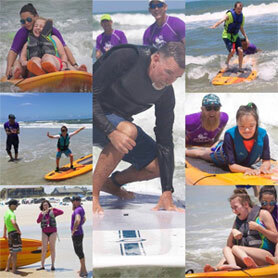 SurfQuest empowers people with disabilities by providing adaptive surfing instruction and therapeutic educational programs on water recreation, and enriches lives by assisting families to access the beach and ocean together in a barrier free environment. SurfQuest acts as an advocate for accessibility to the water that will allow people with limited mobility to reach the beach (i.e. wheelchairs, assisted devices, strollers, etc.). SurfQuest provides adaptive equipment with education and training for the advancement of adaptive surfing. SurfQuest develops partnerships to expand awareness and support of safe adaptive water recreation.